Delve deep into the world of not only Mikhail Kalashnikov’s famous AK47, but everything Combloc related with our new Book of the AK47. Book of the AK47 is designed to educate you about the world of Kalashnikovs, past, present and future as well as everything Combloc related. Peek inside and you’ll find in-depth articles on firearms, ammunition, optic mounts, accessories, plus the men who make and use them. 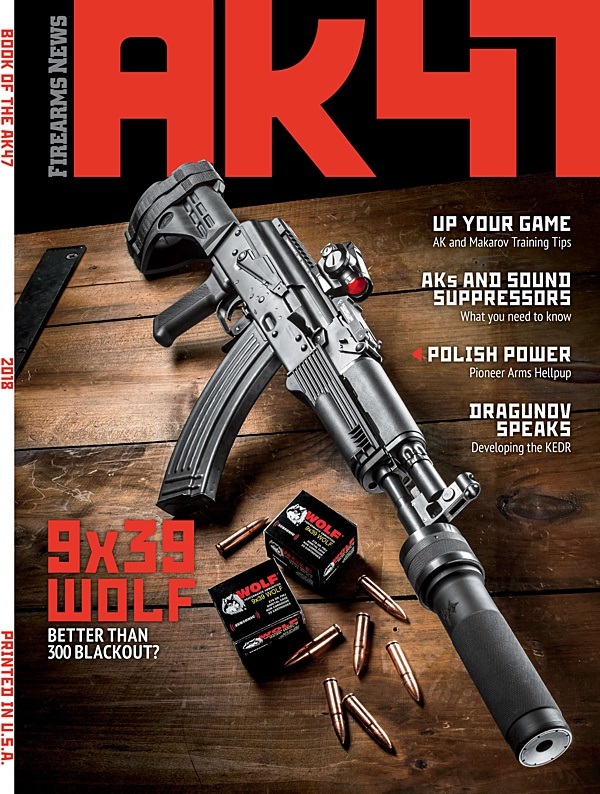 In this issue we take a look at Wolf’s new 9x39mm Subsonic cartridge originally developed for Spetsnaz use, Pioneer Arms of Radom, Poland’s 7.62x39mm Hellpup pistol, Norinco’s Type 86S bullpup and IWI’s 5.56x45mm Galil Ace pistol, the 9x18mm Stetchkin machine pistol and 9x18mm PM Makarov. In this issue Special Forces vet and firearms instructor John Peterson goes deep into training tips and techniques for fighting with both an AK and a Makarov. If you’re interested in modern accessories Sean Utley explores the world of sound suppressors while James Tarr interviews Scot Hosskisson from RS Regulate about his AK scope mounts. If historical pieces are more your style we have you covered as well. Neal Shera explains how the Soviet doctrine of Deep Operations led to the AK47, Leroy Thompson speaks on being a bodyguard in Russia after the fall of Communism, Mikhail Dragunov shares the story of how his family developed the 9x18mm Kedr submachine gun and Richard Venola reminisces about his adventures in Afghanistan in the early 1980s. Along the way we also examine how the AK bayonet performs as a field tool and review Soviet era movies you’ll want to be aware of. If you’re looking for in-depth no BS info on Kalashnikovs, the Book of the AK47 is the grail you seek. This entry was posted in 2010, AK Accessories, AK Books, Buyers Guide, Guns & Ammo, Magazine by gwebs. Bookmark the permalink.